Paul McCartney announces first dates of 'Freshen Up' 2018 tour . Beatles Radio: The Beatles, Solos, Covers, Birthdays, News The Fab 4 and More! Sir Paul McCartney has announced the first dates of his ‘Freshen Up’ world tour – check out details of the shows below. The Beatle will tour in support of his forthcoming new solo album ‘Egypt Station’, which is set for release on September 7. The record – his seventeenth solo LP – has largely been produced by Greg Kurstin. 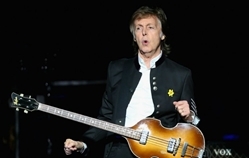 McCartney has today (July 3) announced the first dates of the ‘Freshen Up’ tour, with the musician set to visit Canada for four gigs in September. Tickets for the below dates will go on general sale on July 13 – find out more information on special fan pre-sales here.